I like to recommend films for kids every now and then, and I want to get back to that this week. Accordingly, allow me to point you to a charming 2010 Oscar-nominated French animated film originally titled Une Vie de Chat that was subsequently re-voiced using English language actors as A Cat in Paris. The titular cat of the film is Dino, who lives a double life. By day he is the beloved pet of a little girl named Zoe. But at night he makes a daring (and amusing) journey across the neighborhood to the flat of Nico, who is a (what else?) cat burglar. The two conduct daring robberies until dawn, when Dino races back to Zoe’s bed. Zoe very much needs Dino because she has been so traumatized by the murder of her policeman father that she has lost the ability to speak. This frustrates her grieving mother Jeanne, who is a senior police detective. Jeanne is trying to track down her husband’s fearsome killer as well as the burglar who is stealing precious jewels across the city. She has no idea that the two mysteries will become completely interwoven. The stage is set for suspense and excitement, as well as the possibility of healing both for Zoe and Jeanne. The snazzy, jazzy animation is somewhat impressionistic but not so much that children will be confused. Nico’s movements and figure show that he is at heart as much a cat as Dino. Through some artful drawing and script writing, Jeanne, initially seeming to be on the steely side, is revealed in a scene where she practices martial arts to have a bit of the cat in her as well, albeit hidden under emotional scar tissue. This feline connection ties Dino, Zoe, Nico and Jeanne together thematically and artistically in a way that makes the resolution of the story highly satisfying (even if you are more of a dog person). I watched this movie with three little boys who enjoyed it as an exciting story, but I think I would recommend it even more for little girls. The struggles to understand each other that mothers and daughters can have are well brought out, and Jeanne (voiced by the great Marcia Gay-Harden in the English language verson) is a terrific role model as a wounded but also strong and brave woman. Jeanne chides her daughter at times but when the chips are down, she protects her with inspiring ferocity. Roses to Jean-Loup Felicioli and Alain Gagnol for their artistry and for their ability to craft a film that parents and children can enjoy together. 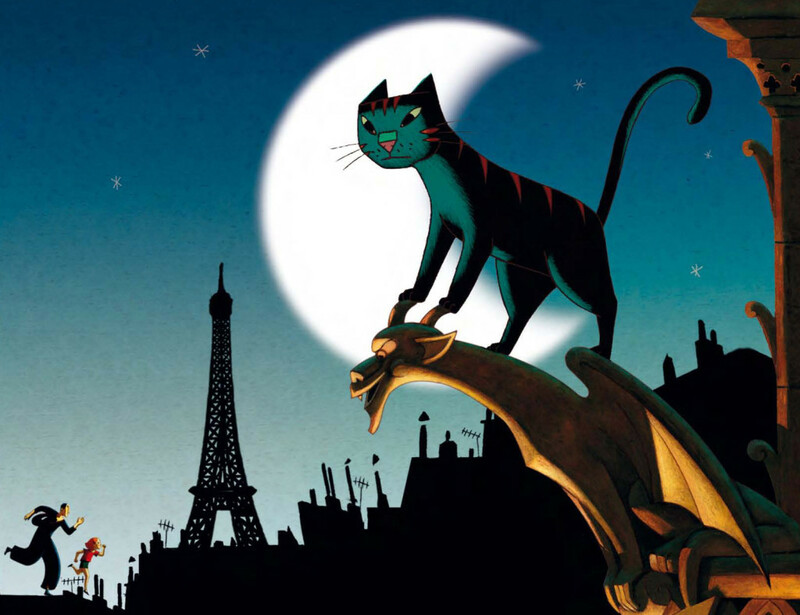 A Cat in Paris delivers drama, excitement, sweetness and laughter in a pleasing combination that will put a smile on your little one’s face and quite probably yours as well.